THEME: The childhood period is the most purified, the most clear, the most natural periods of people.Impossible things are done,"These are done in the childhood period" is said.. The childhood period is the best, the most charming, the most unforgettable period.We understand its value after we lose it.How much we want, we don't bring back it. THEME: The childhood period is the most purified, the most clear, the most natural periods of people.Impossible things are done,"These are done in the childhood period" is said. The giant emperors who had grown in Amasya and they had shaped the world, scientists were child once upon a time.Their childhoods are wondered.May be a geographer Strabon who had lived in Amasya, had played the hide-and-seek game in his childhood period. How the great lover Ferhat and Şirin could know where they toured along the İris River in childhood, now legend of love is to do the sculpture. Our the first poet of the court Mihri Hatun had played with corn babies in streets of Hatuniye with her friends.May be Fatih Sultan Mehmet Khan who closed the Middle Age, opened the New Age; had played the marble game in the Fethiye town in his childhood period. Yavuz Sultan Selim is the one of the emperors of the world who is concluded three continents, had played snowball with his friends.He might have played tipcat game in The Castle of Harşena in his childhood.Amasya's streets are secret heaven which is divided in two parts by the İris River.The İris River is overshadowed by the Harşena Mounth.Who could know that the children would be a famous geographer, poet,emperor and a legend who had lived in these streets. 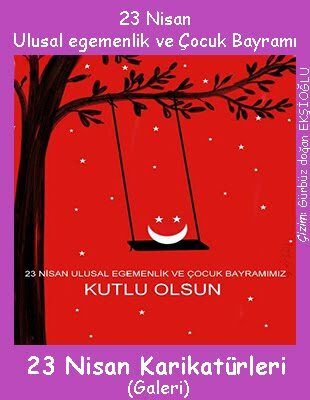 We want to remind again the forgotten days of our childhood and traditional child games.We want to remind and introduce these to other cultures with these ideas.We wish good luck about your caricatures about the theme "To be a child in Amasya". To the close of business Tuesday,April 12,2016. 2- Selected council members and their first-degree relatives may not participate in this competition. 4 - On the front side of your envelope you must right “Amasya Belediyesi 7.Uluslararası Karikatür Yarışması’’ and your name and surname. No participation will be accepted if your work doesn’t reach the given address by 12st of April, 2016. * The honorable mentioned will be given to 3 participants under the age of 18 to encourage young artists. 1 - It is going on by the end of Tuesday April 12,2016. 2 - Jury assessment meeting will take place Saturday April 23,2016. 3 - The results will be announced on the 25th of Aprily 2016. 1 - The transportation money that will be given to selected councils members will be TL 1.250. This price will not change under any circumstances. This money will not be given to the council member who is the vice-president of Amasya’s municipality. 2 - Members of the selection Committee who want to participate in the award ceremony, transportation and the cost of accommodation will be borne by the municipality of Amasya. 3 - Any caricatures that are fancied by the council members will be put up for exhibition. The date, time and place will be determined by Amasya Municipality. 4 - If the winner of this competition lives outside of the town then all expenses will be paid by the municipality. Transportation (bus) is included in this. If the winner is foreign then the travelling expenses made with in Turkey only will be paid! If you wish to bring a guest with you then they have to pay for themselves. If the winner is unable to come to the ceremony then the prices will be sent to their home address. 5 - Only domestic accommodation and transportation fees will be paid of our participants who are from abroad and awarded with a prize. 7- Under 18 years of award-winning competitors and a person from parent's accomodation and transportation costs will be covered. 8 – Whether the participant is awarded with a prize or not every rights of using the caricatures pass on Amasya Municipal authorites. 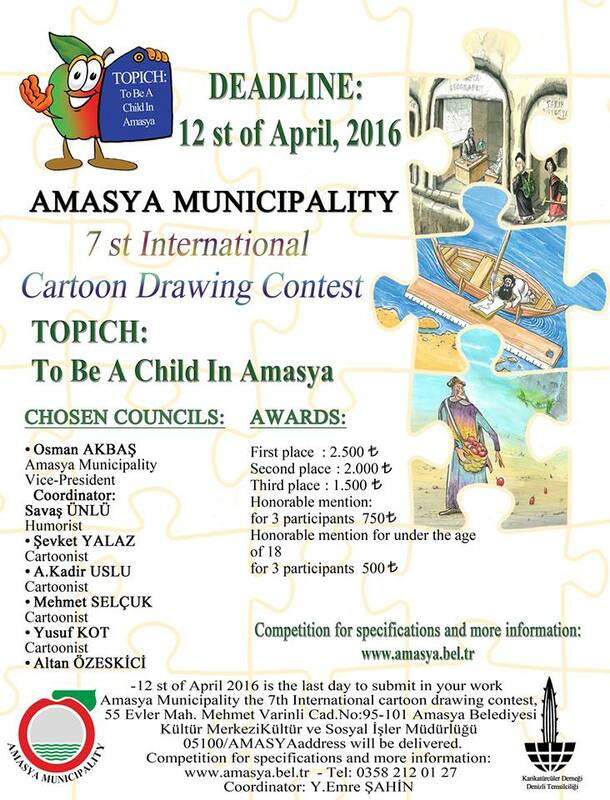 9 - Participants received prizes or not, Amasya Municipality also benefit from any use rights of caricatures. 10 - From all the drawings sent a few will be chosen and made into an album prepared by Amasya Municipality. If your work is in this album or if you earn a price then a copy will be sent to you as well. 11 – The caricatures which sent to the competition, selected by the jury and found well enough to display on exhibition, will be collected in an album which will be organized by the Municipality of Amasya.These albums will be sent only to the degree of the participants,whose works published in this album. 12 - All the competitors that submit their work will be regarded as if they accepted the rules mentioned above. 55 Evler Mah.Mehmet Varinli Cad.